The President and Congress have many important items on their agenda: wars, deficits, gas prices, energy policy, and more. No list of key issues is complete, however, without adding education. Improving the performance of American students strengthens our economy, increases our productivity and ability to innovate, and creates high paying jobs. 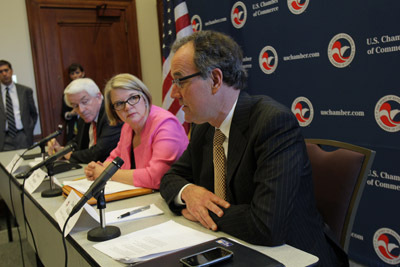 Dave Adkisson, president and CEO of the Kentucky Chamber, speaks about the Elementary and Secondary Education Act at a press event hosted by the U.S. Chamber's Margaret Spellings and U.S. Chamber President and CEO Tom Donohue. on May 4 in Washington to meet with congressional leaders and release the U.S. Chamber’s recommendations for reform. As the president of the Kentucky Chamber, I provided the Kentucky business community’s perspective to the development of these recommendations, and I join our national Chamber in urging Congress to swiftly pass an ESEA that incorporates our principles for reform. Kentucky’s education system has made great strides the past several years. For example, we have adopted solid academic standards in math and reading, and we strengthened our use of data to inform teaching and learning. But we clearly have more work to do. Kentucky needs to improve its teacher compensation and evaluation systems, close the achievement gap between students from different backgrounds and, through the right kind of charter school legislation, make other opportunities for educational excellence available for students and their families. To help us achieve these goals, Kentuckians need a strengthened ESEA that commits itself to the success of every child while providing additional flexibility and authority to states to improve student achievement. We must infuse accountability throughout ESEA; we cannot afford to turn back the clock to the days when billions of federal dollars were spent without any expectations for student results for taxpayers’ investment. High academic standards and assessments for all students. Each state should hold all students to the same challenging, relevant academic standards. States must continue annual statewide assessments of every child in reading and math. Rigorous accountability for all schools. To ensure college- and career-readiness, we must maintain a strong accountability system that sets annual targets, a deadline for producing results, disaggregates results of different types of students, and includes all students in all schools. Clear information and real choices for parents and students. Meaningful options, including charter schools, and clear information should be provided to all families, particularly those whose children are trapped in persistently low-performing schools. Recognize and reward effective teachers and principals. States should create systems to identify, develop and retain effective teachers and principals who produce real gains in student achievement and closing the achievement gap. These systems should determine decisions about tenure, compensation, rewards, equitable access to effective teachers, and dismissal. Tenure policies often hamstring local officials’ ability to ensure that students have access to the most effective teachers. Federal law should encourage, not inhibit, state and local efforts to make changes in their tenure policies to quickly and fairly remove ineffective teachers who fail to improve. Taxpayer Accountability and Information. Federal education policy should encourage innovation and promote what works to improve student performance and ensure taxpayer dollars are spent wisely. This includes supporting data systems that inform decision-making at all levels by providing timely and accurate information to educators, parents, taxpayers and the public, and by supporting analysis and use of that data. The Kentucky Chamber is committed to working with Congress, the Administration and other stakeholders to ensure that all children, particularly disadvantaged children, receive a world-class K–12 education. When it comes to improving our economy and preparing young Americans for high quality jobs, there is no single more important step our nation can take. We urge you to join our effort.